Sifting through photos I took on my recent trip to New Zealand and visit to Ruth and Paul Pretty’s marvellous property on the Kapiti Coast just north of Wellington, www.ruthpretty.co.nz I came across a couple of pictures of Paul cooking a remarkable breakfast. I say remarkable not just to compliment the cook – although he could do with a bit of praise as the concomitant to his celebrity chef wife – but more so because I discovered and savoured so many exceptional ingredients in one modest yet totally enlightening breakfast. Fundamental to the experience was the freshly laid free-range eggs collected that morning from their own flock of chickens. And the Italian parsley plucked straight from the garden, whipped up to make simple scrambled eggs – but scrambled eggs with incredible flavour and deep yellow colour, so ingrained in my olfactory senses that every time I cook scrambled eggs back here in Singapore, they taste utterly bland and depressingly substandard to which I yearn for farm-fresh produce. 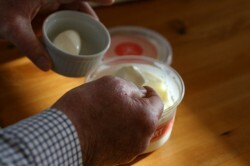 Then there was the yoghurt; Zany Zeus Greek yoghurt made by Michael Matsis with inspiration from his Greek Cypriot mother. This artisan cheese maker and dairyman has been flying under the radar for years, which partially explains why we have not heard of or instantly recognise the brand, supplying direct to cafes and restaurants throughout the Wellington region with feta, halloumi, smoked varieties, cultured products and organic milk. He has however recently started a retail shop just down the road from the milk and cheese factory in Lower Hutt, and is branching out into premium ice-cream, but more on this in a separate article. I just wanted to flag how amazing this yoghurt is; like no other I have tried – ever. It is incredibly thick, almost like crème fraîche or double cream, with a wickedly luscious, creamy richness and yet melts in the mouth with subtle sweetness (read creaminess) and harmonious, gentle sourness lingering long on the palate. 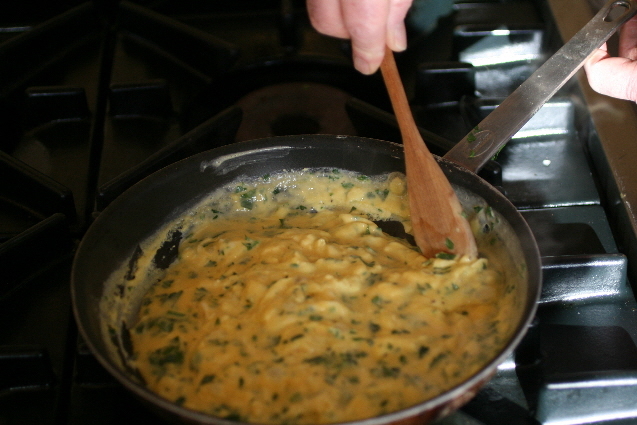 Paul was showing it to me whilst he was cooking and I cannot rightly recall if a dollop made it into the scrambled eggs, which makes sense to me as I always add a heaped tablespoon of crème fraîche to mine. At the same time, Ruth was preparing a little porridge, wanting to show me her latest discovery, organic Canadian Steel Cut Oats. “Ruth, we are having scrambled eggs not porridge!” bellowed the Sous–Chef de Cuisine. “Yes, I know!” replied the Chef de Cuisine, “I just want him to taste these brilliant oats with Michael’s yoghurt”. So I ploughed my way through the scrambled and then the porridge; a sort of breakfast pudding if you like. I must declare that absolutely hate porridge and physiologically scared from early childhood when I had my tonsils out at Wellington Hospital. In those days, the aesthetic was methoxyflurane, a gas emitted through a large black rubber pipe over ones mouth. I will never forget the smell, taste and anguish of this pipe although even more traumatizing was the Cremota Porridge we were forced to it for the next 3 days. Cremota was a popular brand in the sixties that was highly milled/processed rolled oats and had a very pasty, gluey texture. Actually, it was practically the texture and taste of wallpaper glue and what was worse, it formed a coagulated skin on the top when it went cold. I vividly remember the battle-axe nurses forcing me to eat this horrible porridge, skin and all, gagging and subsequently vomiting all over the bed and ward; all part of the food torture adults loved to inflict on kids in the era (something I am writing more on soon). Alas, I have never eaten porridge again but did not have the heart to reject Ruth’s enthusiastic offering. However, much to my surprise and elation, these steel cut oats were a revelation tasting more like sweet risotto or rice pudding – a wonderful coarse, grainy and chewy texture, as in pleasantly chewy – and a subtle nougat nutty flavour. 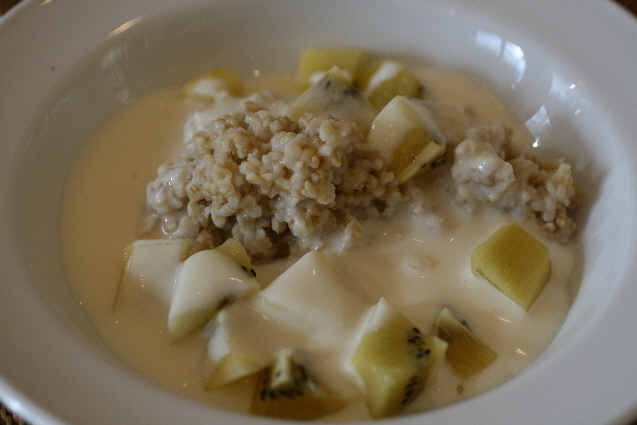 Combined with the Zany Zeus yoghurt and chunks of Golden Kiwifruit, it was incredibly tasty, if a not delicious breakfast, moreover very healthy – well that said given the amount of food I had eaten by this stage it was halfway between heaven and heart attack. So, after 42 years abstaining, I am a born-again porridge eater, thanks to Ruth Pretty. I have tracked down some Steel-Cut Oats here in Singapore, but must ask Ruth for the actual cooking technique or recipe. Unfortunately Zany Zeus does not export (yet!) however I do enjoy (in Singapore) another New Zealand yoghurt from Puhoi Valley http://www.puhoivalley.co.nz, especially their ‘Divine Berries from Nelson Bays’, wickedly lush in berry syrup-like topping and again very creamy and when I say creamy, about 5 times the viscosity of the commercial-pedestrian yoghurts the dominate the supermarket shelves. 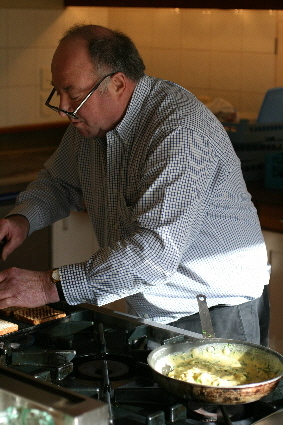 Meanwhile, all I can think about now is Paul’s scrambled eggs; you see it’s an occupational hazard for us food writers as we are in a constant state of mentally gorging ourselves, our neurotransmitters tormenting us with a myriad of smells, textures, flavours of great produce, fascinating food discoveries and tantalising recipes – like a compulsive behaviour obsession-related anxiety that there are not enough meals in a day to bridge our physical and cerebral gustatory disposition.